Studies have found Borrelia burgdorferi in the blood of patients with early Lyme disease using culture tests. 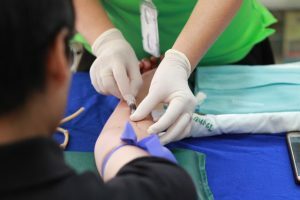 It is unlikely that an individual will donate blood if they have had a tick bite, erythema migrans (EM) rash or were ill, the author writes. But there could be donors who are unaware they have Lyme disease. They may not have seen a tick bite or EM rash and may be asymptomatic and not exhibiting any symptoms of the disease. This, in turn, would pose a theoretical risk. After all, researchers have shown that it is possible to transmit B. burgdorferi spirochete in mice. Investigators, however, do not know if transmission can occur if the blood is stored under blood-storage conditions. Furthermore, another Borrelia species, B. recurrentis has been shown to cause transfusion-associated relapsing fever, the authors point out. And these microorganisms share several common elements. It is also possible to transmit via transfusion the tick-borne pathogen Borrelia miyamotoi. Additional studies are needed to determine the risks and reassess the blood bank criteria. “It is necessary to consider determining what the optimal criteria and policies should be, such as the appropriate use of approved diagnostic methods, for monitoring blood products for possible contamination with the Lyme disease spirochete, especially in geographic areas in which B. burgdorferi infection and other related tick-borne diseases are endemic,” Pavia writes. Pavia CS, Plummer MM. Transfusion-Associated Lyme Disease – Although Unlikely, It Is Still a Concern Worth Considering. Front Microbiol. 2018;9:2070. Wormser GP, Bittker S, Cooper D, Nowakowski J, Nadelman RB, Pavia C. Yield of large-volume blood cultures in patients with early Lyme disease. J Infect Dis. 2001;184(8):1070-1072. Gabitzsch ES, Piesman J, Dolan MC, Sykes CM, Zeidner NS. Transfer of Borrelia burgdorferi s.s. infection via blood transfusion in a murine model. J Parasitol. 2006;92(4):869-870. Thorp AM, Tonnetti L. Distribution and survival of Borrelia miyamotoi in human blood components. Transfusion. 2016;56(3):705-711. 3 Replies to "Could a blood transfusion transmit Lyme disease?" “It is unlikely that an individual will donate blood if they have had a tick bite, erythema migrans (EM) rash or were ill, the author writes” They MUST be kidding, right??? How many of us went years/decades being told that there was NOTHING wrong with us, so we did our best to live our lives as if that were true – including donating blood, being on organ transplant lists and more. I happen to know that I’m not the only one that donated blood, or had that I was an organ donor before it was confirmed I had these infections. The authors of this paper have raised an important question as the the potential risk. They are not discussing specific cases. Their paper lays down the foundation for further study.